Another of my old posts. So, the trailer just sits there, almost, but not quite finished. The holidays hit, and we all know how that goes. And then January hit and we decided that we are going to put this house on the market as close to March 1 as possible. Which means we have to essentially be ready to walk out the door by then. All extra stuff in storage, all non-needed stuff sold or donated. So, for the past week I’ve been sorting, weeding through, boxing, packing, distributing, planning, etc, etc, etc. We moved Flower Girl up into Princess Girl’s attic bedroom to free up mainfloor bedroom to use as a staging/storage room until such a time as we can have a yard sale and get a storage trailer to put all the extra things into. So far, three rooms are almost finished (Both girls’ rooms, and the school/play room.) I’m amazed at all the STUFF we all have! At any rate, today we didn’t do ANY packing or sorting or organizing or anything. Nope, we’ve decided that today would be a day of rest. So, we went to church this morning, then to lunch at my mom and pop’s house. After lunch, the grandparents watched the girls while the Hubby and I went and saw The Hobbit. 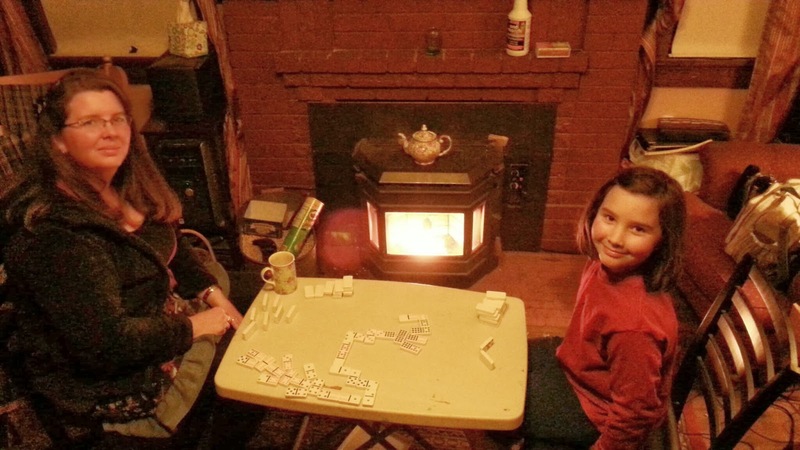 By the time we got home, it was evening, so Princess Girl and I played dominoes till bed time while Hubs watched tv on his laptop and Flower Girl ran around. It was a nice, relaxing day, and I’m so blessed to have been able to just relax. It was hard at first, though. On the drive home, I kept thinking of all the things I could get organized or packed in the hours till bedtime. But I also knew I just needed to spend some quality time with my girl before we started back into another hectic week. It was a great way to finish off a wonderful day. And tomorrow, with a trip to the DMV to register the trailer and finding boxes and packing, packing, packing is going to be productive enough. I’m so thankful for restful days. Now here’s hoping I can sleep well and get a restful night! This entry was posted in Castle Rock Homestead, est 2014 and tagged Homestead Kids, moving on February 16, 2015 by Maridy.